You’ve figured out your face shape, so you’ve gotten a good start when it comes to picking a pair of glasses—but what about choosing glasses that fit well? When you look at eyewear online, you’ll see measurements including eye, bridge, and temple size—what do these numbers mean? This is where you start when looking for the proper fit. When it comes to getting glasses that sit on your face properly—without pinching or causing discomfort—you’ve got to hit the measurement sweet spot. More essential than which style frames to choose for your face shape is the actual measurement of the glasses you’re considering. Without properly-fitting glasses, you may find that your eyewear slips, pinches, or causes blurry vision—what good are glasses if they’re more trouble than help? If you’re currently a glasses wearer, your frames will have the measurements listed for you—usually printed on the bridge or temple. The measurements that determine proper eyeglasses fit are printed next to each other—eye size, bridge size, then temple size—and may be separated by a little square icon. Let’s break down each part of the measurement to ensure you’re getting a good fit that will be comfortable to wear. 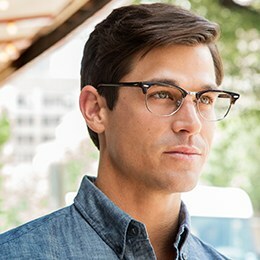 What are all of these glasses measurements? Eye Size is the width of one lens and usually falls somewhere between 40 to 62 millimeters. Your eyes should be centered in the lens. Bridge Size is the measurement of the glasses bridge, or the area between the lenses that goes over your nose. The bridge of the glasses should sit flush with the bridge of your nose. This measurement is often in the range of 14 to 24 millimeters. Temple size is the measurement of the arms of the eyeglasses, from the lens to the part that wraps around the ear. The temple should sit horizontally and hug the ear. This measurement may range from 120 to 150 millimeters. Frame width is the width of the frames—measured inside from hinge to hinge—and may also be referred to as total width. This measurement includes bridge and eye size. The frame width should be slightly wider than your face, but no more than a finger’s width between the temple and your face. Lens Height or B measurement is the height of the lens and determines whether the frames are progressive-friendly. Anything 25 millimeters and larger may be able to accommodate progressive or bifocal lenses. Most glasses discomfort can be traced to fit and can be fixed with a few adjustments. It’s best to have your eye doctor adjust your glasses for you to prevent breaking them—but if you’re careful you can make minor adjustments. The glasses pinch or cause discomfort behind the ears. If your glasses are pinching behind the ears, the most likely culprit is the temple fit. If the glasses temples are too short, they will not rest comfortably behind the ears. If they’re the right length, but pinching, they can be adjusted for a better fit. The nose pads leave marks or pinch the nose. If your nose pads are uncomfortable or leaving marks, your bridge may be too narrow. The nose pads can be adjusted on metal frames—carefully pulling them apart slightly may do the trick—but plastic frames are not easy to adjust. Choosing glasses with the appropriate bridge size can make glasses more comfortable on your nose. If your glasses are slipping, the issue may be with the temple size, bridge size, or weight of the glasses. Check the temples—are the arms adjusted correctly? Do the screws in the arms need to be tightened? Is the bridge too wide? The bridge may be able to be adjusted on metal frames by pushing the nose pads slightly closer together. Heavy frames or lenses may cause the glasses to slip as well. If you’re new to wearing glasses, you may need a few days to become comfortable wearing your new frames, as well as to get used to your prescription. For the most comfortable glasses experience, get your new frames adjusted at an eye doctor’s office and wear them when you’re supposed to so you can adjust to the prescription. The most comfortable glasses fit depends on a few things: proper glasses measurements, consideration of frame and lens weight, and professional adjustments to your frames. If you’re looking for new glasses, start with your current, comfortable pair to figure out what size frames you need or measure your own face to get the best fit.